In this lesson, we will learn how to rotate a shape through 90, 180, and 270 degrees about the origin and investigate what happens to the coordinates as a result. 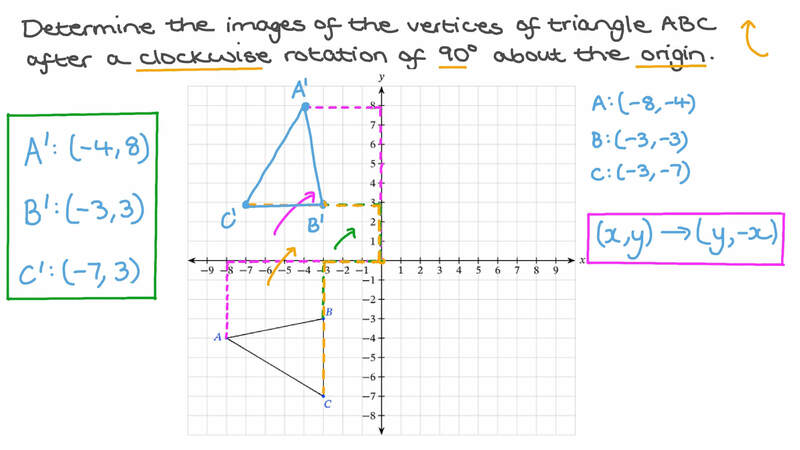 Determine the images of the vertices of triangle 𝐴 𝐵 𝐶 after a clockwise rotation of 9 0 ∘ about the origin. Given that 𝑋 ( 4 , − 2 ) , 𝑌 ( 8 , − 3 ) , and 𝑍 ( 5 , − 8 ) form a triangle, determine the images of its vertices after a clockwise rotation of 1 8 0 ∘ about the origin. What is the image of the point ( − 3 , 1 4 ) after a rotation about the origin through an angle of 9 0 ∘ ? What type of transformation is the following? What is the image of 𝐴 𝐵 𝐶 𝐷 under the transformation ( 𝑥 , 𝑦 ) → ( − 𝑦 , 𝑥 ) ? Which transformation can turn the letter d into p? Which transformation can turn the letter Z into N? Which of the following represents a rotation of the shaded figure? A triangle has its vertices at the points (2, 1), (3, 2) and (2, 4). The triangle is rotated 9 0 ∘ counterclockwise about the origin. At which of the following coordinates will the image have its vertices? Rotate the given triangle about the origin 9 0 ∘ clockwise. 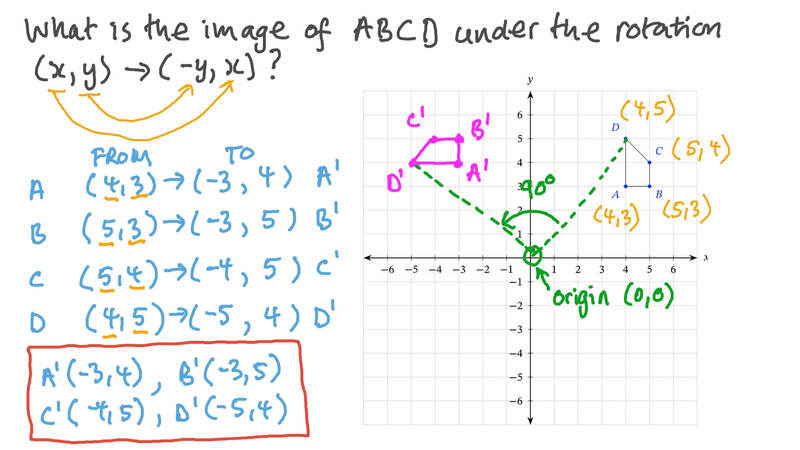 Which of the following sets of coordinates will be the vertices of the image? Determine the coordinates of the vertices’ images of triangle 𝐴 𝐵 𝐶 after a counterclockwise rotation of 1 8 0 ∘ around the origin. Given that 𝑋 ( 4 , − 4 ) , 𝑌 ( 8 , − 5 ) , and 𝑍 ( 5 , − 6 ) , form a triangle, determine the images of its vertices after a clockwise rotation of 9 0 ∘ about the origin. Determine the coordinates of the vertices’ images of triangle 𝐴 𝐵 𝐶 after a counterclockwise rotation of 2 7 0 ∘ around the origin. A triangle graphed on the coordinate plane has a vertex at ( 6 , 0 ) . Which of the following rotations would move the vertex to point ( 0 , 6 ) ? The point 𝐴 ( 3 , 0 ) is rotated about the origin by 𝜃 degrees. On which of the given figures will the image of 𝐴 lie? Two points 𝐴 and 𝐵 have coordinates ( − 5 , 1 ) and ( − 2 , 1 ) respectively. 𝐴 𝐵 is rotated 2 7 0 ∘ counterclockwise to 𝐴 ′ 𝐵 ′ . Determine the coordinates of 𝐴 ′ and 𝐵 ′ . Is the length of 𝐴 𝐵 greater than, less than, or equal to the length of 𝐴 ′ 𝐵 ′ ? Describe the single transformation that would map triangle 𝐴 𝐵 𝐶 onto triangle 𝐴 ′ 𝐵 ′ 𝐶 ′ in the given figure. A triangle has vertices at the points seen in the figure. Rotate the triangle 9 0 ∘ counterclockwise about the origin, and determine the coordinates of the image. Rotate triangle 𝐴 𝐵 𝐶 1 8 0 ∘ clockwise about the origin, and state the coordinates of the image. Rotate triangle 𝐴 𝐵 𝐶 9 0 ∘ clockwise about the origin, and state the coordinates of the image. ⃖     ⃗ 𝐴 𝐵 and ⃖     ⃗ 𝐶 𝐷 are parallel. Both have been rotated 9 0 ∘ clockwise about the point 𝐸 to ⃖        ⃗ 𝐴 ′ 𝐵 ′ and ⃖         ⃗ 𝐶 ′ 𝐷 ′ respectively. What do you notice about ⃖        ⃗ 𝐴 ′ 𝐵 ′ and ⃖         ⃗ 𝐶 ′ 𝐷 ′ ? In the given figure, a rotation of 9 0 ∘ counterclockwise about the point 𝐵 ′ would map triangle 𝐴 𝐵 ′ 𝐶 to triangle 𝐴 ′ 𝐵 ′ 𝐶 ′ . Does it follow that the two triangles are congruent? A rotation about 𝑋 takes 𝑍 to 𝑍 ′ and 𝑌 to 𝑌 ′ . What is the angle of rotation? If 𝑋 𝑍 = 4 5 , what is 𝑋 𝑍 ′ ? In the given figure, if 𝑀 is the midpoint of 𝐴 𝐵 , then 𝑏 can be rotated 1 8 0 ∘ about 𝑀 to 𝑎 . Hence, 𝑎 and 𝑏 must be congruent. Is this statement true or false? 𝐴 𝐵 is rotated 9 0 ∘ clockwise about the origin. Is the length of the image resulting from this transformation greater than, less than, or the same as the length of 𝐴 𝐵 ?